Alright, I am caught up with my Pull List series; nothing old I need to catch up on. Pull List #8 (or even #9, if someone finally takes up my offer to contribute) will consist entirely of comic books released in 2013. The good news is that most of these comics are also pretty fresh. I’m like a jinx with these, seriously. Here’s another series that looks to be coming to an end. Issue 25, coming in March, is an issue entitled “Finale” in an arc entitled “Final.” The solicit doesn’t say Final Issue, mostly because it doesn’t need to. In this issue, beginning said arc, a line from Stephen King about zombie movie The Night of the Living Dead comes to mind. He noted that though the movie ends with the the zombie siege’s only survivor being shot pointlessly (uh, spoiler alert), if you like horror movies, that’s the game you play (he also pointed out that the similarly black ending added to The Mist improved on his own novella’s much more hopeful ending). Important characters, who, by the nature of the book, have already survived their own horror movies, die suddenly in Hack/Slash #21, including one character who has been around since the first mini-series. So, I guess another spoiler alert if you’ve been following this series that long. Cat and Dog Detective agency are right now safe, so the furry aspect is still there; this issue may well represent the last light-hearted moments between Cat, Pooch, Cassie and Vlad. It’s another obvious line (and the solicit for #25 also used it), but from here on out, the question is: who will survive, and what will be left of them? Nobody dies in this issue (I’m sorry, I meant “nopony dies”). Just going to spoil that one for you. However, our pony heroines do spend the majority of this issue in a deep dark abandoned mine on their quest to save the Cutie Mark Crusaders from Queen Chrysalis. Rainbow Dash would rather they go over the mountain, but she gets outvoted, so they go under the mountain. And if that doesn’t sound familiar, well, they meet a cave troll. This is My Little Pony as epic fantasy, except its still very much a silly funny animal comic book. Which is actually what it needs to be; there’s a cave troll, but he’s a wonderfully goofy guy who really loves “PON-AYS!” There’s also a collection of giant cave spiders; Fluttershy is disappointed in how aggressive they are, but Pinkie Pie is more than a match for them. The main challenge faced by the heroic little ponies is Queen Chrysalis’s changelings separating the cast into groups of two, then using their shapeshifting abilities to challenge the ponies’ friendships. Admittedly, this is essentially the same plot as Discord’s in the show, but it almost worked for him, so you can’t blame Chrysalis for trying. This issue of Teenage Mutant Ninja Turtles opens up slowly, with a lot of time spent on the characters and their personal reaction to the last arc. We even get a moment with Shredder and Karai – if only to remind us, hey, they still exist in this universe, too. Eventually, in order to find out more about what the heck is going on with all these mutant animals and ninjas and mutant ninja animals running around, April agrees to see if she can get some information from Chet, one of her bosses at Stockgen. He agrees to meet her in the park, and April begins to try and figure the guy out, when suddenly and out of nowhere, Chet, a.k.a. Professor Honeycutt, a.k.a the Fugitoid, gets an urgent call from his home planet. Turns out the guy was a robot alien from Dimension X. Maybe not the classical way to move the plot forward, but it’s a comic book called Teenage Mutant Ninja Turtles. Just go with it. Hey, at least now we get to welcome the Neutrinos to this universe. Ben Bates is on art duty this time around; I like his art a bit better than the usual stuff; he’s cartoonier. There’s also a really cool, really subtle bit where April’s breath is apparent in the cold, but robot alien Chet’s is absent. That’s called foreshadowing, and it’s a bit more classical. Whoever that is in Hack/Slash, they're far better at crossing things out than I am. 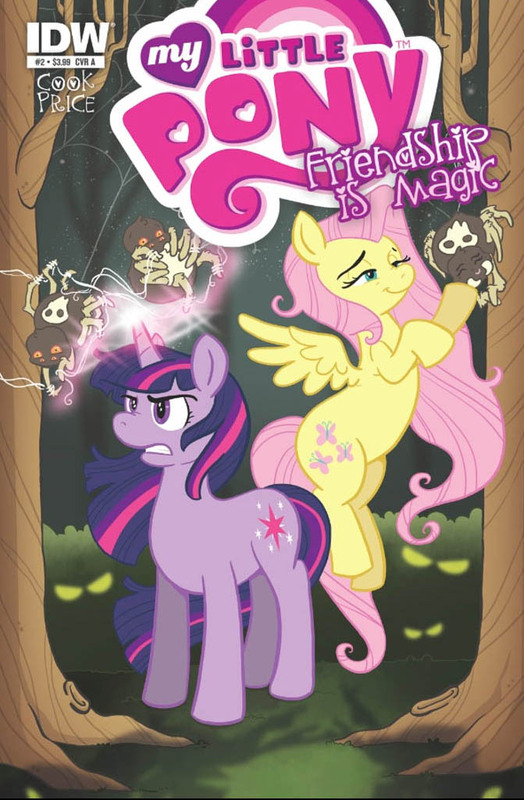 Not digging the style on the cover of MLP #2. Twilight Sparkle looks constipated. Read TMNT: The History of the Foot Clan - I'm really looking forward to Alopex getting some more screentime (Mutant Female Arctic Fox for those not familiar with the character).